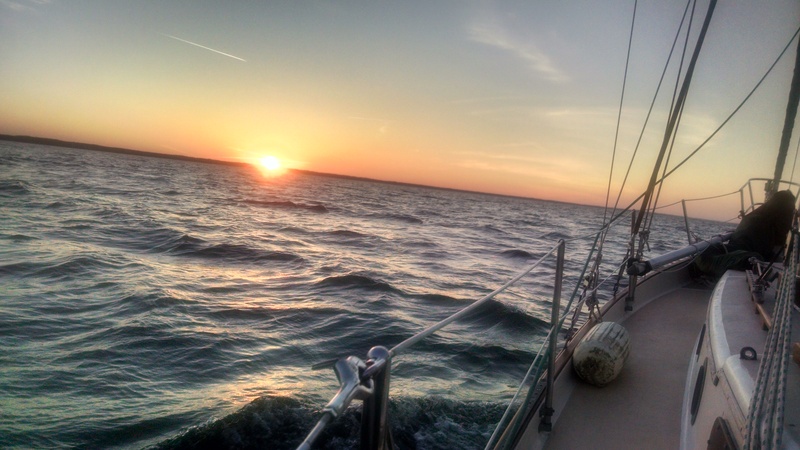 SAILING STUFF | chesapeaketidings & more..
For some weeks I anticipated this extended cruise. Substantial planning was done with multiple alternatives built into the float plan. Destinations were set, both north and south, and on both sides of the Bay. Decisions were to be made each day depending on wind and weather – objective being to maximize sailing time. and then look around to see if they got it at all right! Day one: First change. Destination was reset in order to meet up with sailing friends at Swan Creek Marina in Rock Hall. It was a good party and conditions allowed for at least some motor/sailing time over a relatively short distance despite pretty light winds mostly on the nose. I also took on two crew from the club for the one-way trip. 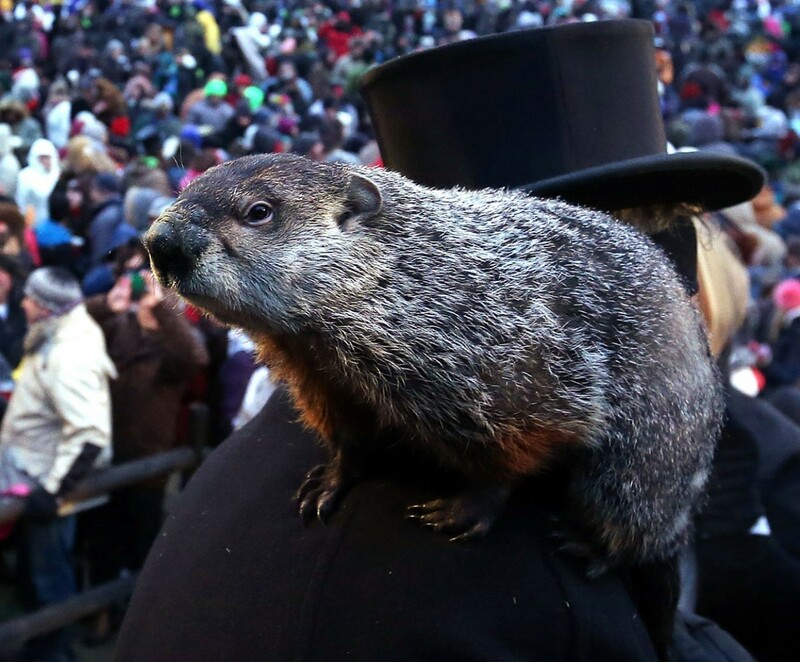 Give the weatherman an ‘A’ for accuracy on this one. By way of Face Book, I heard from a fellow cruiser traveling generally in my direction, and not far away. So we began the dance of trying to connect in the same place at the same time……a fast trawler and a slower sailboat with varying weather conditions. 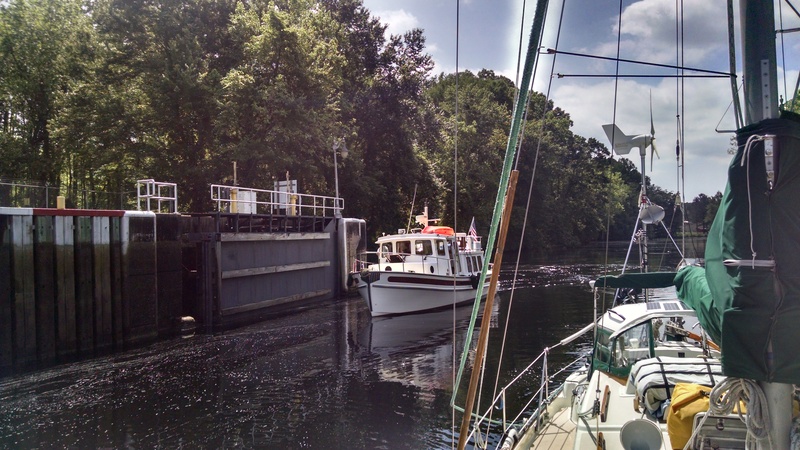 First stop was just north for me at Fairlee Creek – a very nice protected anchorage. Day two: I made an early start with a brief stop for fuel, and headed for Fairlee. I turned into another day of motor/sailing, but at least with a good boost from a favorable tide. The anchorage was still a bit crowded from a busy weekend but, being Sunday afternoon, it cleared quickly. My cruising friends decided to stay put, otherwise a pleasant evening at anchor. Day three: Now weather reports were beginning to be mixed with cautions of approaching T’storms. So, with winds cooperating for a Bay crossing, it was a good day to get back to the western shore and one of several protected anchorages. While not ideal, SE winds enabled a decent sail, and with an outgoing tide I made better time than planned. 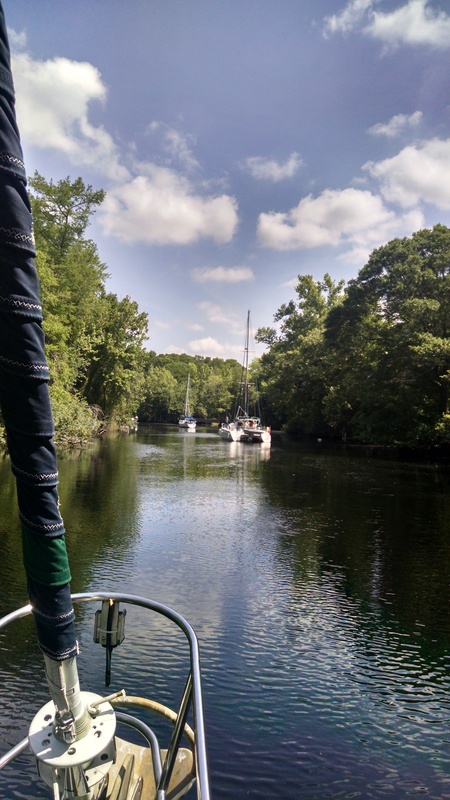 After dodging a couple tugs & tows crossing the commercial channels, I sailed into Eagle Cove off the Magothy River. To the weatherman’s credit, I did encounter a brief shower as I approached the Magothy – give him/her a ‘C-‘ for the day. 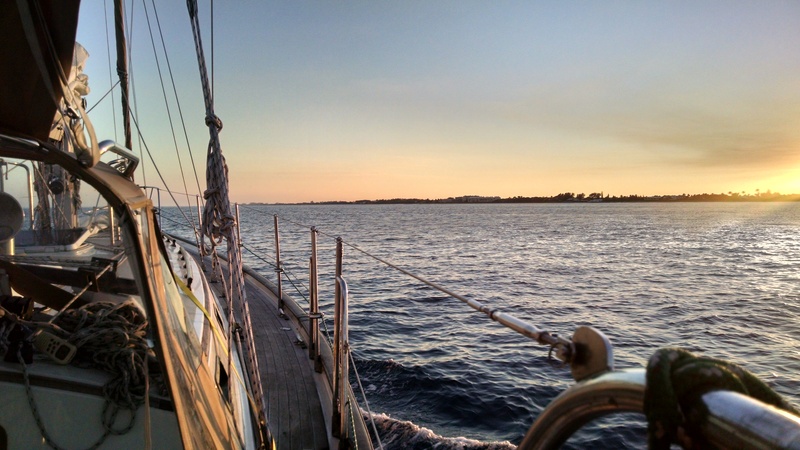 I shared the anchorage with only four other boats, and enjoyed a quiet evening. 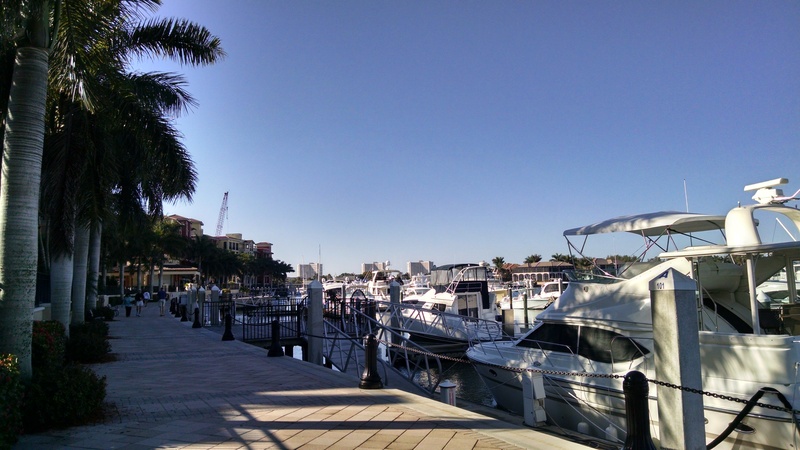 I also reconnected with my cruising friend who was now planning to head to Mill Creek near Cantler’s crab house – good motivation to adjust plans again. Day four: More calls for PM T’storms by the weathermen, but now I had favorable winds and tide for th e run to Mill Creek. 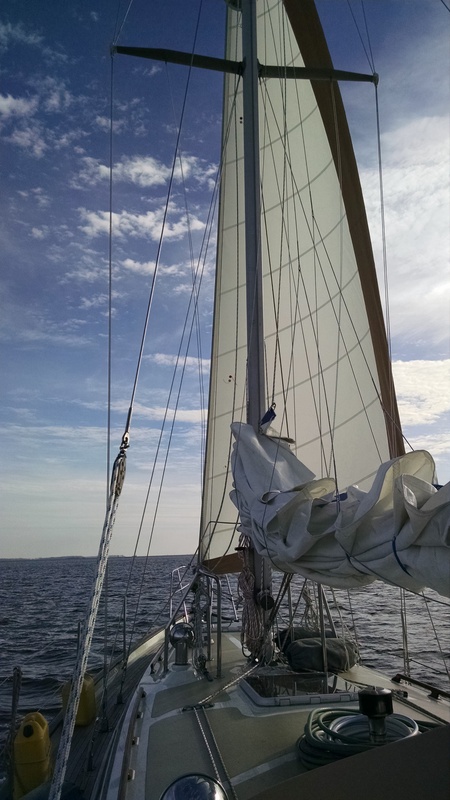 Nearly ideal conditions made for a brisk sail just off the NE wind. Except for a short motor-on to clear the Bay Bridge due to chop and traffic, it was sails up all the way. I passed my friend’s trawler on the way into the creek, but never was able to connect. 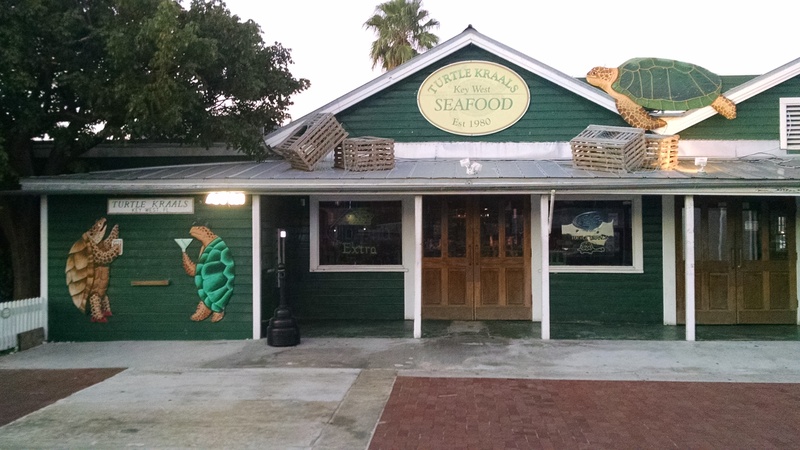 The consolation prize was a dinner of steamed mussels and lump crab cake topped off with key lime pie for dessert! And, it was a short dinghy ride from my anchorage. 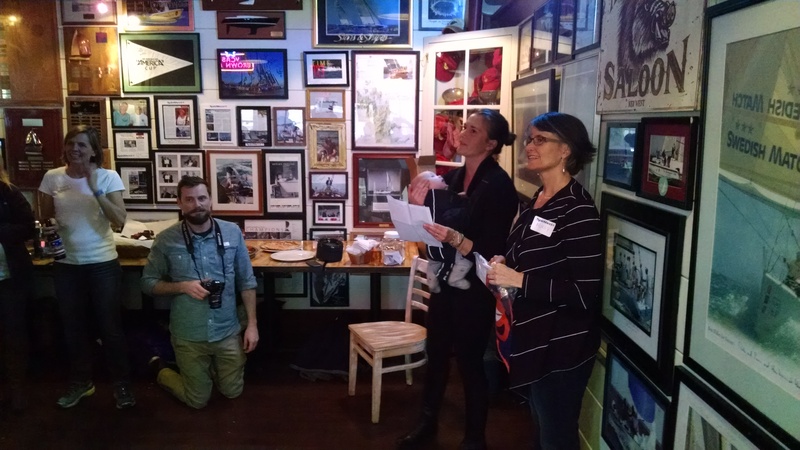 I subsequently learned that, if empty slips, I could have used one free and stayed the night…. next time. Day five: Now running low on provisions (bad pre-planning on my part), I chose to stop back in my home slip (Back Creek, Annapolis) to re-provision, clean and re-organize the boat. It also gave me a chance to lunch and visit with my former slip neighbor. The heat already was building and predicted to get hotter, so a good day to scrub the topsides, and continue the process of weaving netting onto the life lines. The latter project being undertaken to provide for the arrival of a new boat dog (yellow lab puppy), and her safety underway. Day six/seven: With a forecast of very light, but favorable winds for heading south, I made an early start heading to the Rhode River where I would catch up with my sailing club’s weekend raft. The two-day early arrival would afford time to enjoy some quiet time mid-week. Uponleaving the creek I found 8-12 kts of N wind and quickly was under full sail making great time down Bay. Managed to sail nearly all the way into the Rhode River anchorage. After dealing with an aggressive power boat dragging a raft full of kids around my corner of the bay and the buzzing of jet skis, it was steak on the grill and a good bottle of Cabernet. Next day I re-located to the section of the bay where I expected the raft to be set up. Weather was HOT, but the predicted T’storms never arrived. Instead I got a brief 10 min shower. There was also ample time to drop the kayak in the water and explore – always good birding along the shoreline. Day eight/nine: After several days of solo sailing, it was fun to welcome the arriving club boats. Building a raft can be a tense time. At least conditions were calm, if very hot, and the process got accomplished without too much fuss. We completed the linear raft (nose-to-toes) with 10 boats, and spent a pleasant evening sharing treats and stories – even got in a swim to cool down. Weathermen got it right for the sail home on Sunday (day nine) with light SE winds. At least it was worth flying the head sail for the short motor/sail. So, almost none of the ‘best laid plans’ materialized. 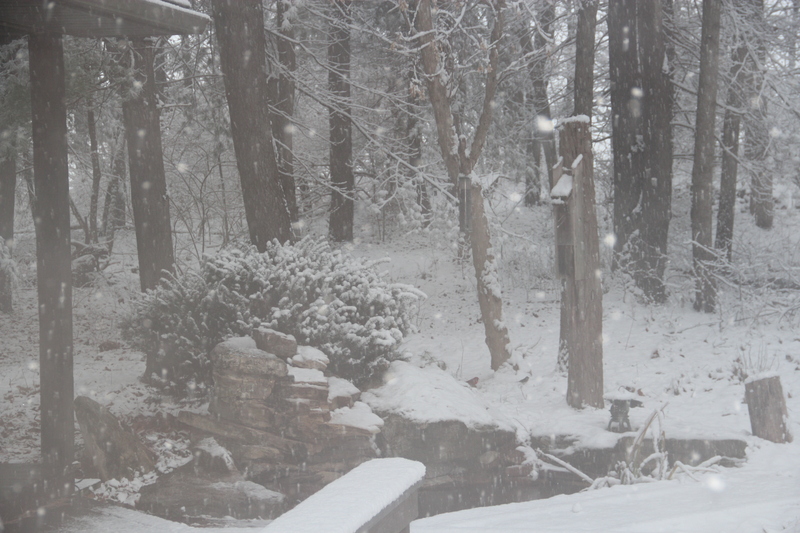 The weathermen managed about 50% accuracy. I never connected with my cruising friends, but got three days of good sailing, a party with some sailing friends and a raft up with others. All in all, not a bad week on the water. Then, when is a week on the water ever bad? 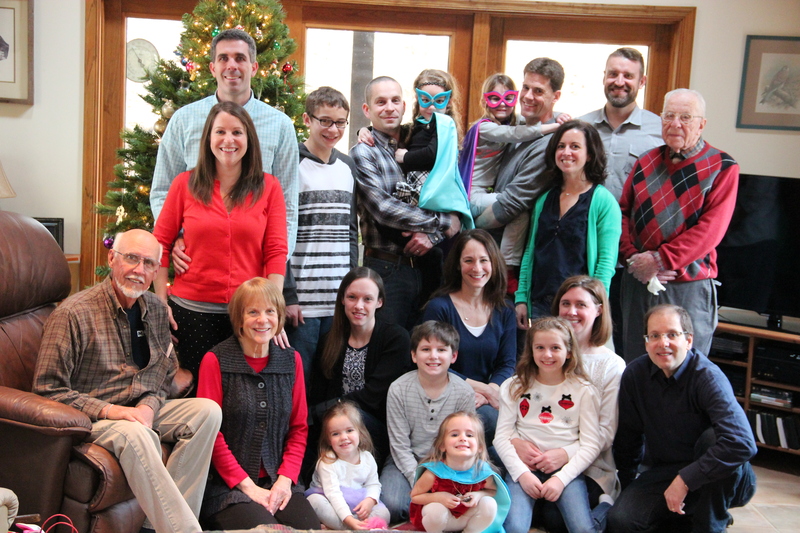 Not sure why we don’t get our own, but guess I’ve had my share of Father’s Days…. In any event, enjoyed a nice sail and dinner at anchor with grandson Tyler. Give a kid a dingy and freedom to wander and don’t expect to see him for awhile! 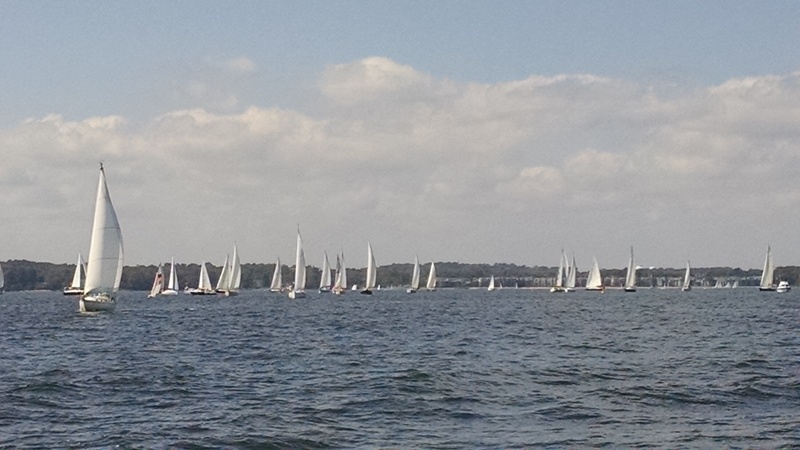 With a forecast of 5 or less we didn’t expect much sailing, but once again the forecasters were wrong. 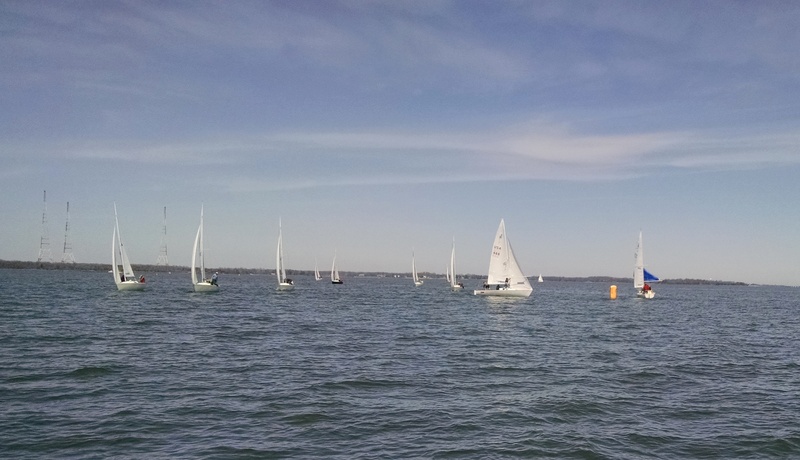 We found 8-15 and flat water … about as good as it gets for a pleasant daysail on the Bay. Just another good day on the water.. 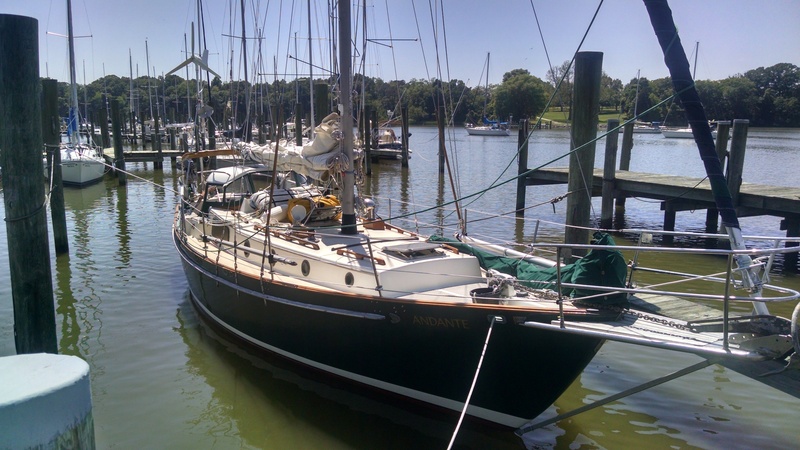 This is a brief account of the delivery of Gryphon, a Passport 40, from the Chesapeake Bay to Marco Island, FL – December 2014. 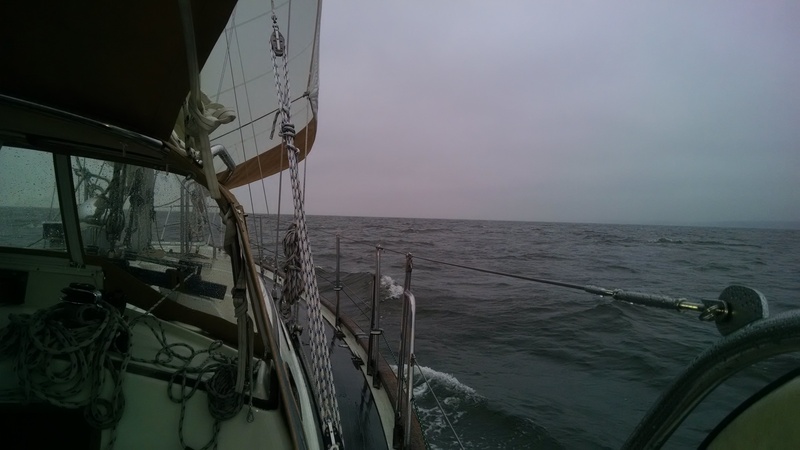 As we ran down the Bay, weather around Hatteras loomed as a critical issue. Approaching Hampton, the choice was clear; drop the hook at Hospital Point and go inside via the Virginia cut to Beaufort. My previous trips were thru the Dismal Swamp, but timing, draft and weather indicated otherwise for this one. The run to Coinjock was uneventful, as were the bridge and lock clearances. 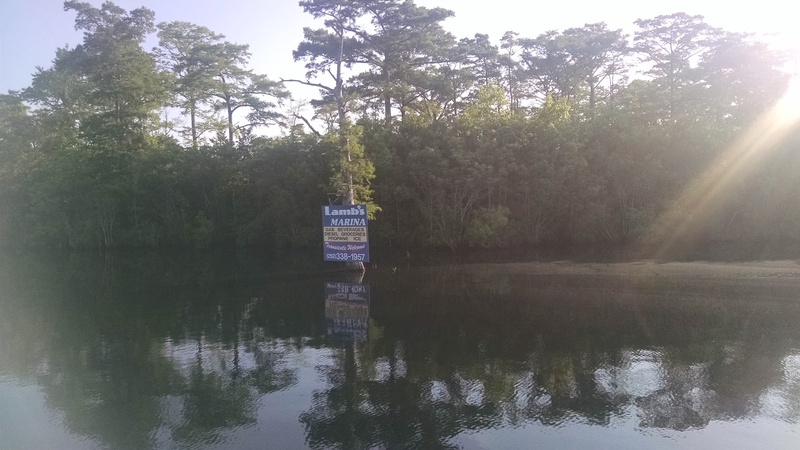 The second day was long…flat water across the Albemarle and up the Alligator River. A stretch thru the canal, arriving to anchor in the dark just short of New Bern. 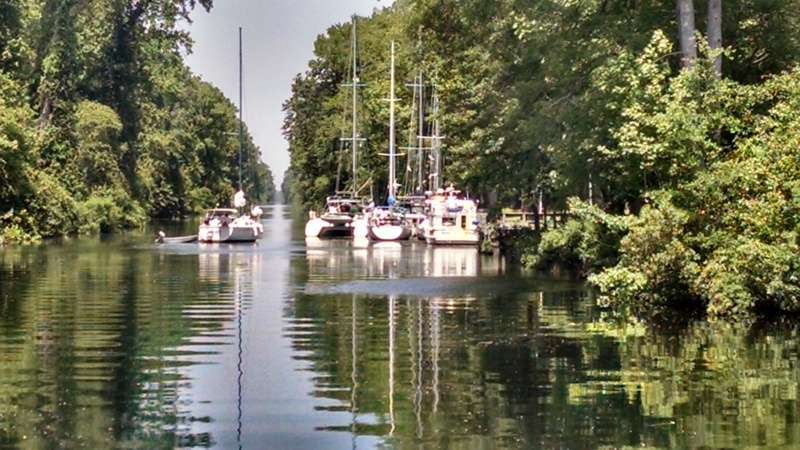 Next day provided a pleasant run down the Pungo and Neuse rivers. Another anchor night, and a wait to time our exit at Beaufort. The remainder or the trip was all outside leaving Beaufort 12/9, and accompanied mostly by a large persistent high that delivered calm, clear conditions. Fortunately the weather began to warm. Not the best for sailing, but made for pleasant motoring days under mostly flat water conditions. A head sail gave some occasional lift. The first glitch came a few miles off Cape Canaveral around midnight. The working fuel tank (of two) ran dry. Engine stalled and no amount of priming was going to restart. Enter Tow boat US, and a trip into Jupiter inlet, and a visit from the diesel mechanic. Same day service had us back on track. 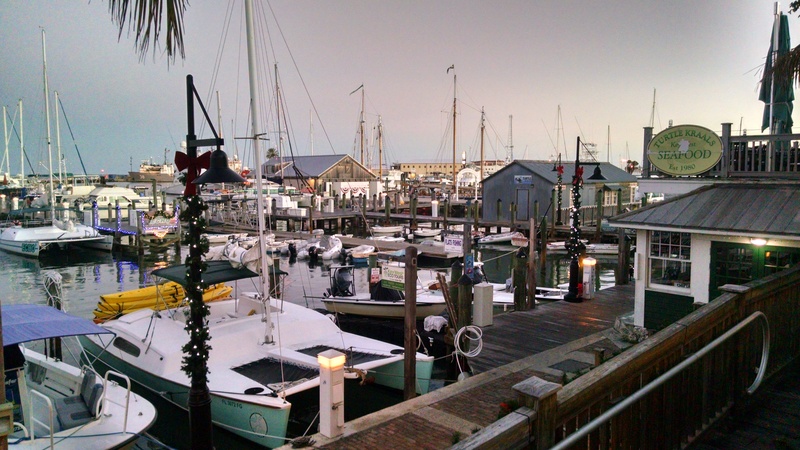 Next stop Key West, arriving at the KW Bight Marina early AM 12/18. It was a good day break, and a chance to visit with KW friends while we prepared to head north up the Gulf. 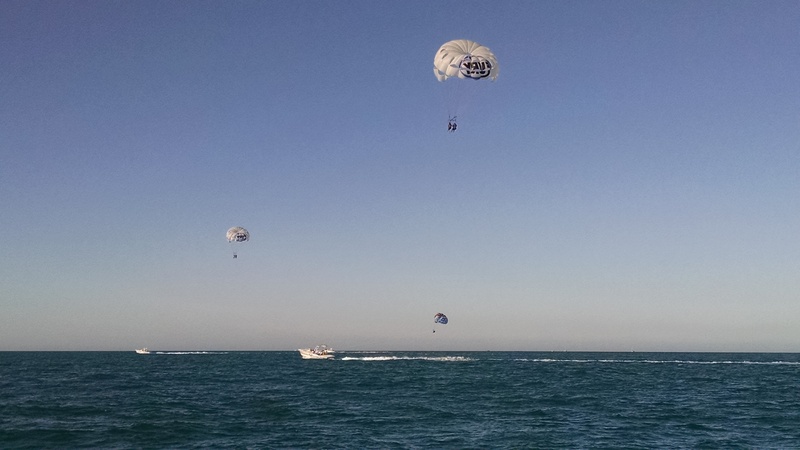 We left Key West in sunny conditions with light winds..
Forecast for the last run to Marco was for 5-10kts and flat water. 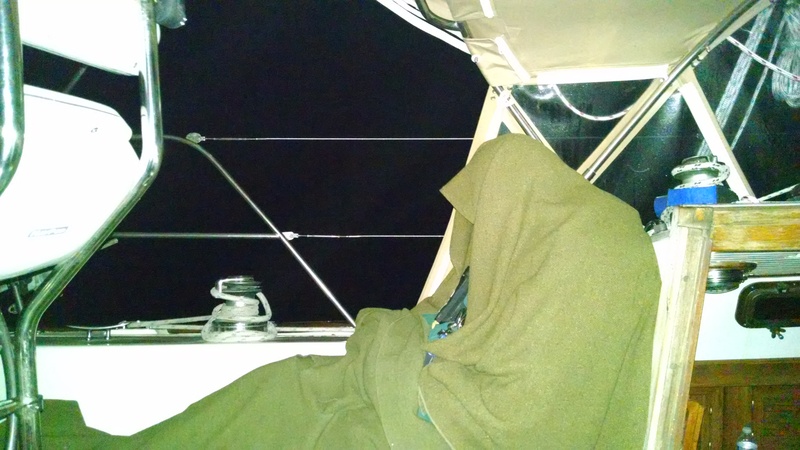 What we got was 20-30kts, 2 – 4 ft short period waves all on the nose…..it was a long night! 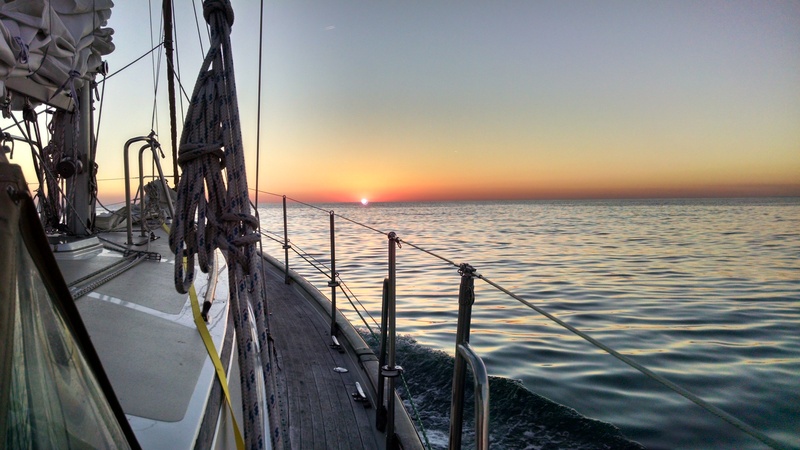 We left Key West about 1600 and arrived off Marco about 0900 next morning 12/19. 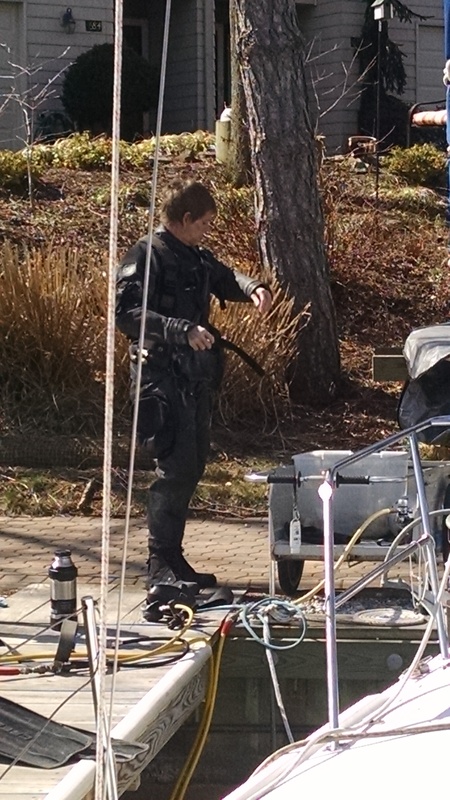 We worked our way in the circuitous channel to the Esplanade Marina – finding the bottom, not once but three times. Safe at last at the slip about 1000. 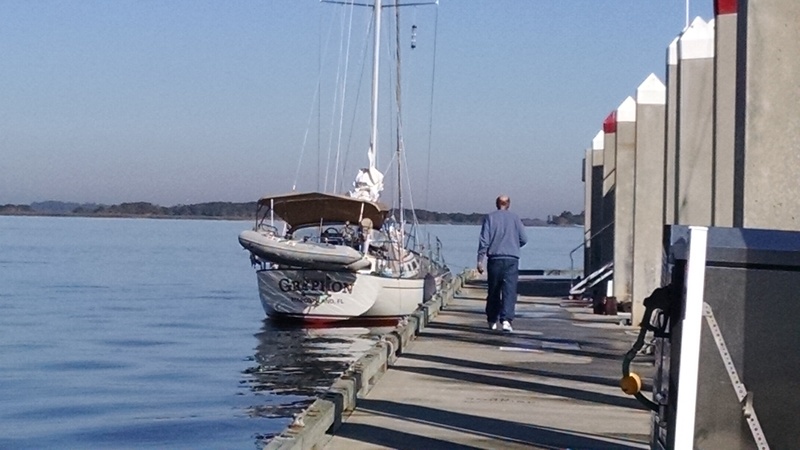 Just as the sailing season began winding down, opportunities for boat deliveries turned up. 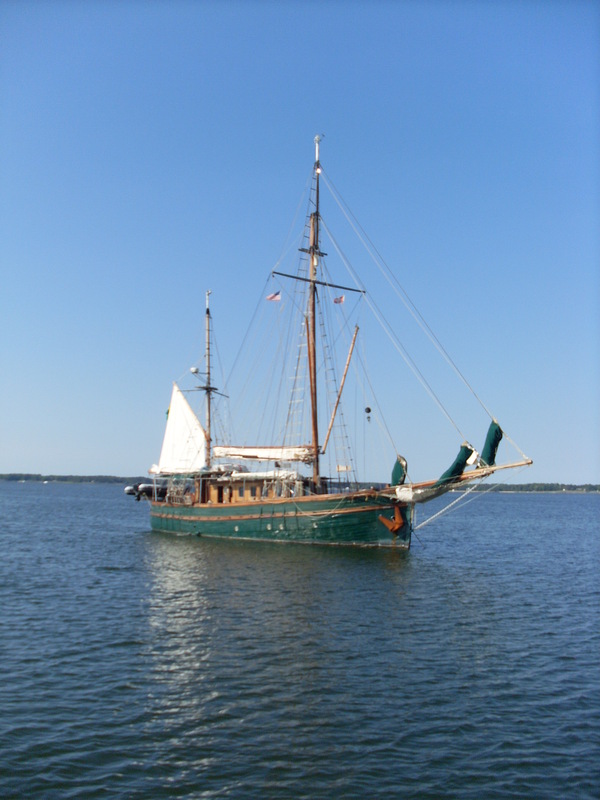 The first was a short run, with owner on board, from Sandy Hook, NJ to Annapolis, MD – a simple 3 day run. What started as such, turned into something of an adventure. With good weather forecast with favorable winds all the way, we departed Atlantic Highland yacht basin early morning, October 19th. The boat was a beautiful Gozzard 36 in great condition, and a very comfortable sailing boat. Rounding Sandy Hook we had a distant view of the NYC skyline …. 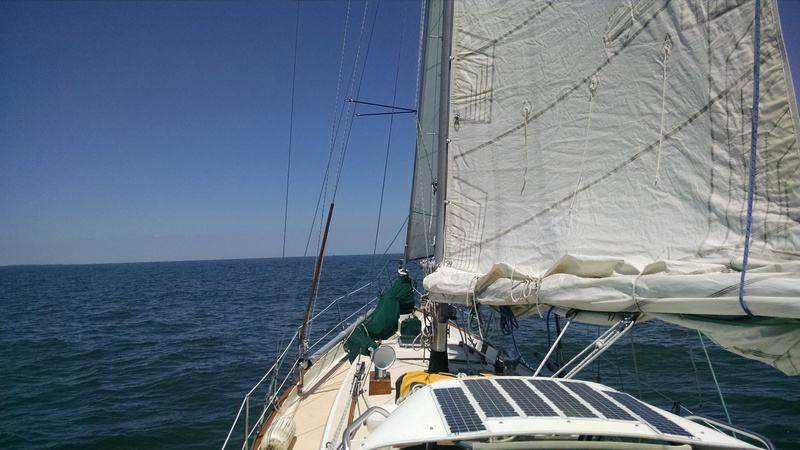 Winds began to pick up and we got sails up for the expected skate down the Jersey coast to Cape May and the Delaware Bay. As with so many good plans, conditions changed. Turning south we found head winds and moderate chop. We were forced to tack well off shore, and made several such tacks working our way down the coast. It was a moonless night with limited visibility, but clear and cold. In the middle of the night we picked up the lights of Atlantic City about the time the engine rpms fluctuated, dropped and died…….. With only one other boat in sight, it was easy to sail on, if slow, and progressively further off shore while we sorted out the engine issue. 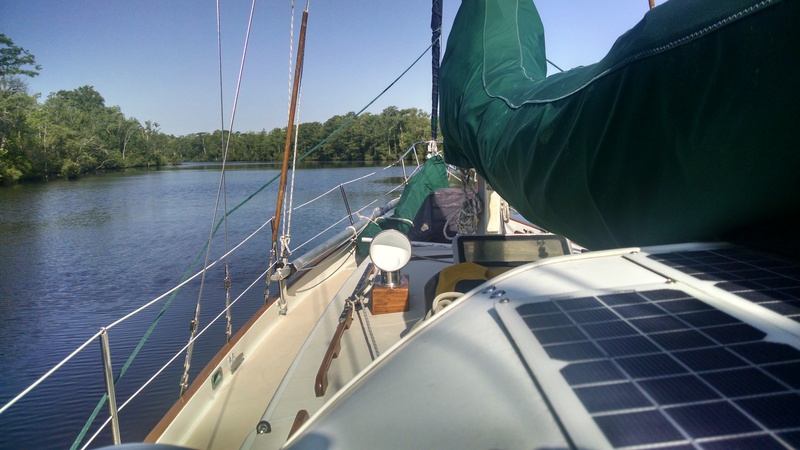 Turns out it was water in the fuel, and cleaning the racor filter got us back motor-sailing more directly toward our destination. The sun came up to another pleasant day, if still a bit choppy..
A few more hours and we turned into Cape May. 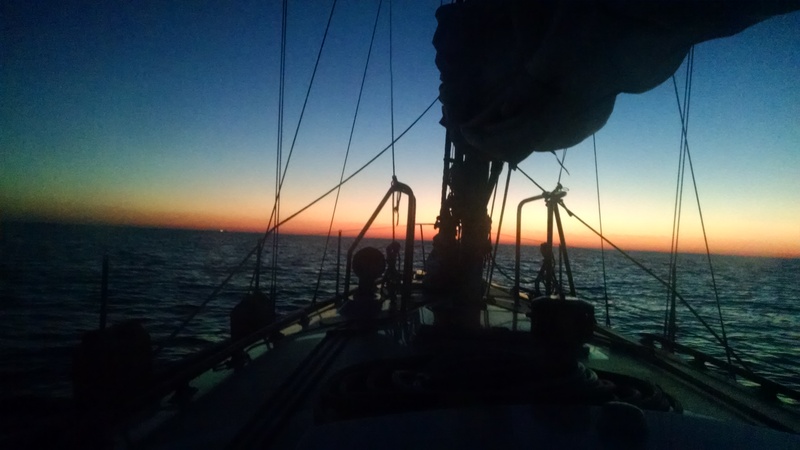 As night descended, we were making good progress and expected to arrive in Annapolis the next morning. It was an uneventful trip though the C&D canal despite a scolding from a tug captain who thought we were in his way as we entered the canal. While well lit, it is still a dark ride. The dark calls for caution when passing on-coming traffic including the large Cargo ship Bess – sorry, no pix, we were busy. As we approached the west end of the canal, lightning lit up the sky, and soon the rain began. Exiting the canal put us in heavy rain and 15-20kt winds and chop. Visibility was down to maybe 100 yds. 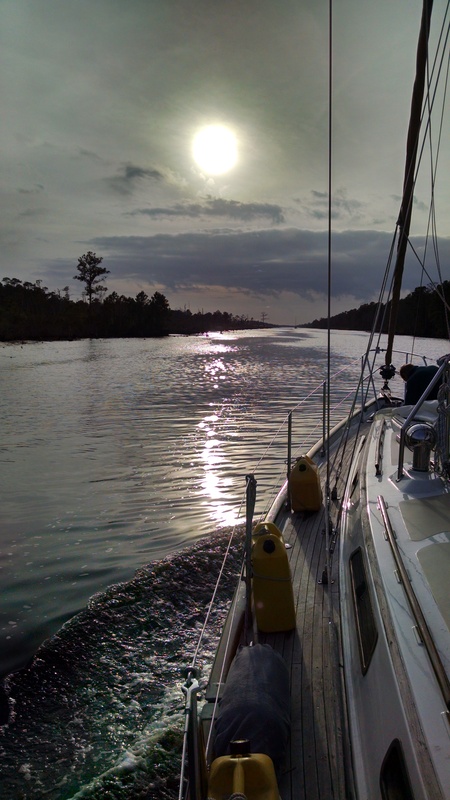 Following the chartplotter, we made it around to the Sassafras River and dropped anchor near what appeared to be a shore-based light. A spot light from there tagged us, and after assuring good holding, we went below for some much needed sleep. The morning found us anchored about 150yds from a large motor yacht – guess we misjudged the shore line! The run down the Bay was quite a ride. Winds were on the stern quarter blowing 15-25kts. Seas gradually built from 2-3ft waves to 5-7 feet, short period. Our speed over ground, motor sailing with genoa and stay sail was 7-11kts – the 11 came when surfing down the 7ft waves. 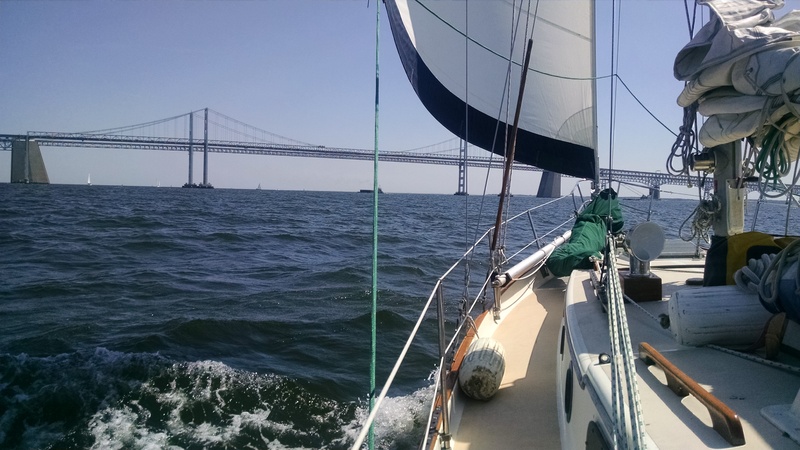 Once under the Bay Bridge, conditions improved and we pulled into Jabin’s Yacht Yard right on schedule after a quick stop for Fuel and pump out. Good company, a variety of sailing conditions and minor emergencies made for an interesting three days!